Isabel and Rachel in PRIME! It’s pretty much impossible to review this show without spoiling the fact that the blurb for the show in the Fringe Guide is in fact the description of the show within the show that is Prime by The Sisters of The Moon. Layers, Isabel and Rachel are good at layers. The audience enters the small black velvet draped space to the strains of Enya while being further assaulted by choking incense belching out at us. Isabel and Rachel really enjoy making their audience suffer for their laughs. Dressed in black velvet cloaks with hoods obscuring their faces Isabel and Rachel lampoon the worst kind of dull, wanky, serious theatre sending the girls in my row into explosive, uncontrollable fits of laughter. I remember how painfully awful some uni drama productions could be (Always with everyone in black with bare feet) and this made me laugh a lot too. Pretty soon everything turns around and all is not as it seems. We are introduced to the performers; recently divorced Deborah (Rachel Davis) and her obnoxious fourteen year old son Jono (Isabel Angus), who valiantly try to mount the advertised Fringe show after being abandoned by Deborah’s performance partner and best friend Jillian. The hyper and obnoxious Jono keeps derailing the production by scoffing at everything and insisting on throwing in his own segments of The Jono Show which he worked out with his mate Macca. Isabel has again created an astonishing charismatic creature in Jono, who unsurprisingly steals the show. She has clearly been hanging out with teenage boys and has gotten all the mannerisms and speech patterns down perfectly. It’s utterly jaw dropping and only the sly hairbun at the back is a reminder that you are watching a woman performing. It’s wonderful also to see Rachel Davis given a bigger space to shine this year as the anchor of the performance; the exasperated, jilted mum who is trying to keep things together. Last year’s Winner of Best Comedy at Melbourne Fringe: Isabel and Rachel’s Edge! was a vicious takedown of the sexualisation of children, the media and Girlie-Girl Culture. This year they explore the hip-hop and Dude-Bro Culture that younger boys are aping but are this time less savage and balance the satire with a warmer heart. There is also a gentle laugh at extreme new-age style feminist culture and the hilarity in the contrast between that and Jono’s revulsion towards it. It took me a while to work out why I felt that this year’s show wasn’t quite hitting the high mark, then realised that perhaps it was the lack of any presence of the father in this tale (unlike last year’s ever-present yet offstage monster Mother) which weakens the concept somewhat as there is less understanding and sympathy for how Jono has been shaped. Still, this is ferociously funny, entertaining and occasionally over the top outrageous. 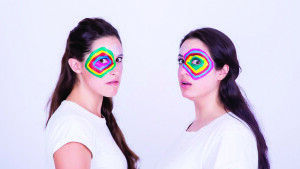 Isabel and Rachel are a wildly talented pair who have again created one of the most fabulous comedy shows at Melbourne Fringe and an unforgettable character in Jono. These women are definitely stars in the making. See them now so one day you can say you were then when….